This quick and easy vegetarian dish is ideal for a stress free meal. 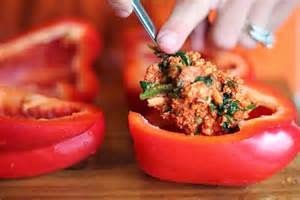 Green peppers or yellow peppers work just as well as the red variety and you can always use other kinds of mini pasta. Just experiment with what you have in your store cupboard. Cook the pasta according to the packet instructions and drain well. 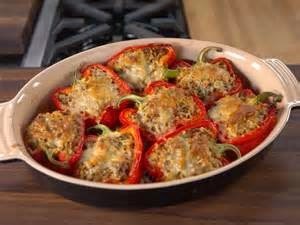 Place the peppers on a baking tray or in a baking dish with the skins facing down. Mix the macaroni, tomatoes, cheese spring onions and parsley together in a bowl. 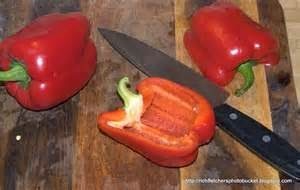 Spoon the mixture into the peppers, drip over the olive oil and sprinkle with salt and pepper. Bake in the oven for 35-45 minutes until the filling is golden and bubbling. 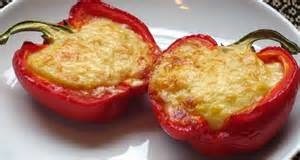 Serve with crusty bread - delicious!